Comments: Wow!! If this tree never leafed out it would still find a place in the garden. Fantastic coral-orange bark throughout winter. Imagine a drift of these near a drift of red-barked maples. Exciting idea. 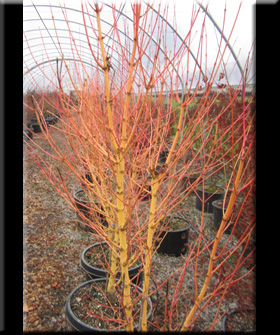 Sadly, (tongue-in-cheek) red buds give way to green leaves hiding this wonderful bark throughout the growing season. Fall leaves are yellow with specks of orange.